Lyme Disease, caused by the spirochete bacteria Borrelia burgdorferi, was first identified in Lyme, Connecticut in 1975. It is spread by bites from the tick genus Ixodes which are infected with the spirochete bacteria. The most common source of Lyme disease is the Deer Tick, or Black-legged Tick (Ixodes scapularis, formerly Ixodes dammini) in the central, upper Midwest and northeast US. A closely-related tick, I. pacificus, is the vector of Lyme disease in the western US, while in parts of the Rocky Mountains, another closely-related tick, I. neotomae, can also transmit it. For Lyme disease to be present in an area, the Lyme disease bacteria must be in evidence, Ixodes ticks to transmit them, and mammals (such as birds and mice, especially the white-footed mouse) to both provide a blood meal for the ticks and to maintain a reservoir of the bacteria to pass the disease from one tick generation to the next. The Deer Tick's life cycle is ideally suited to this purpose. Within a single year, nymph numbers peak prior to the larval numbers, meaning that any diseases the nymphs are carrying (which they picked up the previous year) are transmitted to hosts when the ticks feed. Because the nymph and larval stages feed on similar hosts, the next larval generation is likely to pick up the infection transmitted to the hosts by the previous nymph generation a few months earlier. The newly-infected larvae continue to carry the disease when they become nymphs and adults and can infect new hosts, including dogs and humans, when they feed. The ability to pass the bacteria between different life stages is called" transtadial transmission". It may also be passed trans-ovarially from an infected female tick to her offspring, although this is less common. 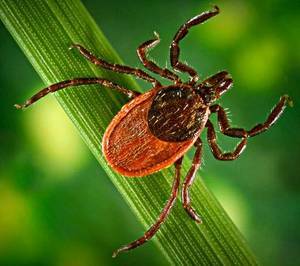 This all makes the Deer Tick an excellent vector of Lyme disease, as there is a constant cycle of infection maintained between the ticks and mice to ensure the disease is passed from generation to generation. Depending on the area, the prevalence of infection in the tick population may vary from less than one per cent to more than 90 per cent. On average, 25 per cent of nymphs will carry the infection and 50 per cent of adult Deer Ticks are likely to be infected with B. burgdorferi organisms. In endemic areas, up to five per cent of dogs develop symptoms of Lyme disease. In these areas, a much higher proportion of dogs have antibodies to the bacteria, indicating they have encountered it and developed an immune response but not developed any signs of the disease itself. Transmission of Borrelia organisms via saliva requires the tick to be attached to the host for at least 24 to 48 hours, as the bacteria live in the gut of the tick and migrate towards the mouth and saliva when they detect the host tick feeding on blood. This is why it is so important to check pets on a daily basis for ticks, and to promptly remove any that are found. The peak time for canine Lyme disease is late spring and fall (not mid-summer, as is common in humans). The incubation period for naturally-infected dogs is unknown, but laboratory showed clinical signs developing two to five months after infection. The clinical signs seen in dogs are variable and non-specific. 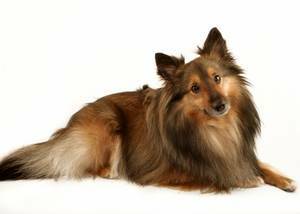 The characteristic rash seen in humans is uncommon in dogs, and those that do occur are localized and transient. The disease occurs in cats only very rarely. While lameness is a common symptom of canine Lyme disease, the crippling, chronic, non-antibiotic-responsive arthritis seen in humans is rare in dogs. The disease is difficult to diagnose soon after infection, as most diagnostic tests rely on detecting antibodies to the bacteria in the dog's blood. These are a product of the dog's immune response to the organism and take four to six weeks to develop to a point where they are detectable. The bacteria is very difficult to culture. general malaise and loss of appetite. After a tick bite, the bacteria disseminate by actively moving through the tissues to the central nervous system and can be found there as soon as 12 hours after infection. Lyme disease should be treated with antibiotics as soon as possible. Commonly-used antibiotics are tetracyclines, penicillins, cephalosporins or macrolides, all of which require a veterinary prescription. Prolonged treatment courses of three to four weeks are normally recommended. Antibiotics do not consistently clear the infection completely, as the bacteria often persist in the skin, the brain, the spinal cord and joints and can reactivate. There are two vaccines available for dogs to prevent Lyme disease, with both requiring annual booster shots to maintain immunity. Your veterinarian may recommend the use of a vaccine if your dog resides in an endemic area. The use of tick prevention products such as Frontline, collars or dips containing amitraz, or permethrin-based products is also recommended throughout the tick season, in conjunction with daily inspections. Your veterinarian can recommend an appropriate product for your dog. Humans can also contract Lyme Disease. However, there is no evidence that they can pick it up from an infected dog. Human infection results from being bitten by an infected tick. Some 200,000 human cases have been reported to US health authorities since 1982, when a national surveillance system was initiated. "In a small proportion of patients, the disease does not respond to antibiotic therapy. There is no human vaccine available for the prevention of Lyme disease." Lyme disease is the most common of all reported vector-borne illnesses in the country. In 2003 there were about 7.22 reported cases per 100,000 people, but it is believed that there was considerable under-reporting. Of all reported cases, 92 per cent were from eight north-eastern and two north-central states ( Connecticut, Delaware, Maryland, Massachusetts, New Jersey, New York, Pennsylvania, Rhode Island, Minnesota and Wisconsin). The disease most commonly rears its head in June, July, or August, corresponding with the seasonal feeding activity of nymphal I. scapularis in the northeastern US. Nymphs are the stage largely responsible for transmtting the diseases to humans. They will bite humans aggressively. Generally, individuals who live or work in residential areas surrounded by tick-infested woods or overgrown brush have a greater risk of contracting Lyme disease, along with people who work or play in their yard, go hiking, camping, fishing or hunting, or engage in outdoor occupations such as landscaping, brush clearing or forestry, wildlife and parks management. A distinctive feature of the rash is that it gradually expands over several days, reaching up to 12 inches across. The center of the rash may clear as it enlarges, resembling a "bull's-eye". If left untreated, infection can spread to other parts of the body within weeks. The joints, heart and nervous system are most commonly affected. This can continue for years after the initial symptoms as intermittent bouts of arthritis, featuring severe joint pain and swelling. Large joints are most often affected, particularly the knees. Infected humans can also suffer sleep disturbances, fatigue and personality changes due to chronic brain infection. As with dogs, treatment for humans is by taking long courses of antibiotics. In a small proportion of patients, the disease does not respond to antibiotic therapy. There is no human vaccine available for the prevention of Lyme disease. If you, or your pet are found to have a tick, it should be removed immediately. Do not touch the tick with your fingers and ensure it is pulled out gently backwards, grasping the tick as closely as possible to the mouth parts to avoid leaving the head embedded in the skin. Tilley L.P., Smith, F.W.K. The Five Minute Veterinary Consult Canine and Feline. Second Edition. Lippincott Williams & Wilkins, Baltimore, 2000.